First, it's important to define the significance of input levels. Then, details on the measurement technique will be given. Two-tone, third-order intermodulation distortion (IM) expresses the degree of nonlinearity of an electronic device that has a definable dynamic range, such as an amplifier or mixer. This characteristic is dependent upon input levels, as well as operating frequencies and terminating impedance. So, two-tone, third-order distortion must be measured under specific performance conditions. The two most common errors in the measuring process are (1) failure to provide adequate isolation between the two input signal generators and proper impedance matching, and (2) insufficient filtering of the two input test signals. Without adequate isolation and matching, interaction between the test generators and the device-under-test may produce significant errors (as high as 20 dB). Without sufficient filtering, the generator harmonics will contribute to the distortion displayed on the spectrum analyzer and device performance thus will not be properly evaluated. Before proceeding with the actual test, it is very important to emphasize that two-tone, third-order IM distortion is only meaningful when the input levels to the device-undertest are defined. Without stating these input levels, the IM figures have no significance. To illustrate, suppose you wanted a device with a two-tone, third-order level of -60 dBc. You could set up the test equipment and vary the input levels from two RF generators until you eventually reached the -60 dBc IM level. However, unless your particular application dictates exactly the same RF input levels as your test setup provides, the IM distortion figure is meaningless. 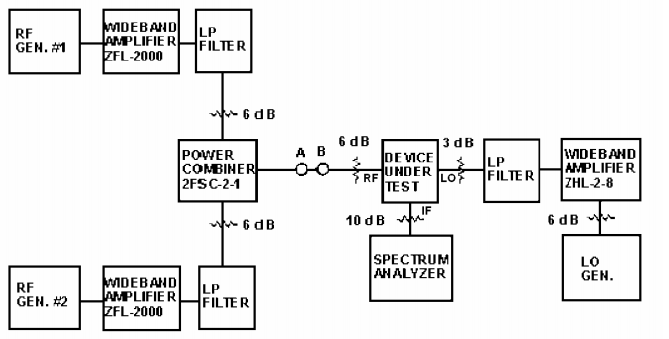 For example, examine the spectrum analyzer display for a ZAY-1 double-balanced mixer, Fig. 1. The third-order components of the spectrum are the two small ones directly adjacent to the two main ones. Notice the significant difference in third-order component amplitudes when using an input level of –10 dBm for each tone compared with 0 dBm input level for each tone. To repeat a key point, the input level of each signal must be specified before the IM test is begun. Figure 1: For meaningful two-tone third-order IM values, use the same input levels in your test setup as your specific application requires. This example of Model ZAY-1 mixer performance with +21.5 dBm LO power shows significant difference in IM levels with RF input of –10 dBm per tone vs. 0 dBm per tone. The second key consideration is the need to specify the amount of two-tone, third-order power relative to some reference level. The reference level can either be the amount of RF input or the desired IF output. Using the desired IF output as the reference is generally more meaningful. A proper test setup for mixers up to 1000 MHz, as an example, is shown in the block diagram of Fig. 2. The two RF input generators are isolated from each other by (1) two wide-band (10-2000 MHz) amplifiers Mini-Circuits model ZFL-2000, (2) two 6 dB pads, and (3) a power combiner, Mini-Circuits model ZFSC-2-2. This combination provides about 70 dB of isolation between the two RF signals. Mismatch and generator interaction are considerably reduced by this arrangement. Figure 2: A proper test setup for measuring two-tone, third-order IM distortion is shown. Note the use of two amplifiers and 6 dB pads for RF generator isolation and proper 50-ohm matching. A practice of simply using a Tee-connector to combine generators develops mismatches and produces undesired harmonics, which dramatically affect accuracy. A low-pass filter follows each amplifier to remove generator harmonics, since harmonic suppression as low as 60 dB can upset the two-tone, third-order measurement. If the harmonics are not well filtered, the measurement result may be degraded from the true value by as much as 20 dB. Here's why. Assume one of the generators has second-harmonic content. When the RF generator signals are applied to the mixer, the mixer will generate its own second-harmonic output. Now, suppose a second harmonic from the RF generators is 180 degrees out-of-phase with the mixer's second harmonic. They may cancel, causing the two-tone, third-order product to be drastically reduced. The numbers from such a measurement would look very good but could pose a serious error for engineers using the results as a basis for system design. On the other hand, if the generator and mixer second harmonics were in phase, they would add and increase the two-tone, third-order product by as much as 3 dB. Therefore, without filtering the harmonics of the two-tone RF input, there is likelihood of obtaining inaccurate results. Pads are included at each port of the mixer (device-under-test) to maintain a well-matched 50-ohm system. The pad at the RF port allows the device-under-test to be checked at two input levels to verify that the spectrum analyzer is not contributing errors due to its own harmonic content (more on this point later). Mini-Circuits offers a wide variety of low-cost fixed attenuators that can be used in this setup, including HAT to 2000 MHz, VAT and UNAT to 6000 MHz, and BW to 18 GHz. For high-level mixers, a wide-band amplifier is included between the local oscillator (LO) generator and the device-under-test. This additional gain permits an LO level as high as + 17 dBm to be applied even with the isolation pads. To proceed with the two-tone third-order IM measurement, first set the power input to the device-under-test from each RF generator. To do this, disconnect RF GEN #2 and replace with a 50-ohm pad or termination to maintain proper matching. Adjust the level of RF GEN #1 until the desired power at “A – B” (Fig. 2) is obtained. To set the power level of RF GEN #2 repeat the procedure disconnecting RF GEN #1 instead. Next, place the spectrum analyzer after the filter and check the integrity of the setup; no second- or third-order components should be observed. If distortion level is excessive, change components of the setup and adjust gains and losses to suppress the distortion. Next, observe the wide-band amplifier by means of a spectrum analyzer placed directly at its output (with padding as necessary to avoid damage). Again, no second- or third-order component should be seen on the spectrum analyzer display. If the input signal to the device-under-test has to be reduced to reach the requisite level, apply attenuation before, rather than after, the wide-band amplifier in order to reduce its input level and thus the amount of amplifier distortion. Maintain sufficient dB-value in the pads at all three input terminals to the device-under-test to provide a constant 50-ohm impedance over a broad band, in order to avoid reflections due to mismatch. Now, check that the spectrum analyzer (in the location shown in Fig. 2) is not contributing to the distortion. If the input to the device-under-test is changed 3 dB, a 9- dB change in distortion product should be observed on the spectrum analyzer. The reason: The output of a double balanced mixer is proportional to the cube of the input. If two equal-amplitude signals (EA=EB) are applied, the output would be (EA)³. Thus, if input EA is changed by 3 dB, the distortion at the output should change by 9 dB. Suppose this 3:1 change is not observed. What is the problem? It could be with the test setup or the linearity of the spectrum analyzer. That's easily determined in this manner: Add 10 dB attenuation between the IF output of the mixer and the spectrum analyzer and repeat the measurement with a 3 dB change of RF input power of each tone. If the change in IM product is 9 dB, the spectrum analyzer is responsible for introducing distortion. If, on the other hand, less than a 9-dB change is noted, the RF portion of the test setup is at fault. Go back to the RF generators and make sure they are not interacting. If it is difficult or impossible to observe the intermodulation distortion (IM) output of the device under test, obtain a spectrum analyzer having greater dynamic range. Or, use a higher level input signal and extrapolate the results to the lower level based on the 3:1 change in IM / input signal relationship. For ultra-low distortion mixers, this approach may be the most practical. In sum, upgrade your test setups and system designs with Mini-Circuits' full line of low-cost, high-performance RF signal-processing components.